I'm thrilled to share all the international attention Wild Ideas has been receiving. For more information select a category: awards, reviews, interviews, and events. Thanks for visiting. Wild Ideas is the WINNER in the "Self Help Personal Development" category of the International Soul-Bridge Body-Mind-Spirit Book Awards of Europe—an international award celebrating books that embody excellence and communicate a high value spiritual message to the world. Wild Ideas has been awarded a SILVER Medal from eLit Awards, "a global awards program committed to illuminating and honoring the very best e-books published each year for the North American market." Wild Ideas is the 2017 SILVER Winner for Self-Help in the 20th annual Foreword INDIES Book of the Year Awards. Founded in 1998, Foreword Magazine, Inc. discovers, reviews, and shares the best books from small, university, and indie presses as well as self-published authors. Wild Ideas has received a Bronze Medal from Dan Poynter's Global Ebook Awards in the "Non-Fiction, Inspirational/Visionary" category. These annual awards honor the legacy of Dan Poynter, author, speaker, and pioneer in the indie-publishing industry, and continue his dedication to promoting high-quality independently published books. Wild Ideas has been honored by Reader Views with a Reviewers Choice Literary Award for "content originally, production quality and design, impact of message and resourcefulness." Wild Ideas has been chosen as one of the finalists by EPIC, the Electronic Publishing Internet Coalition, whose mission is to provide a strong voice for electronic publishing. The final round of competition will take place later this year. Wild Ideas has been named a Notable 100 Book in the Shelf Unbound Best Indie Book Competition. Shelf Unbound Indie Book Review Magazine features the best of small press and self-published books. Each issue reaches 125,000 avid readers in more than 70 countries. The Northern California Book Festival has chosen Wild Ideas as its WINNER in the "General Nonfiction" category. Wild Ideas has been honored with a gold Medallion Award from indieB.R.A.G., a book readers appreciation group that includes readers, both individuals and members of book clubs, located throughout the US and in ten other countries around the globe. BlueInk Review has listed Wild Ideas: Creativity from the Inside Out as one of their Best Books of 2017. The Nonfiction Authors Association has awarded Wild Ideas a SILVER Medal for excellence in the quality of writing, editing and overall design. The CIPA EVVYs, one of the longest-running international book award competitions on the Indie publishing scene (over 25 years), awarded Wild Ideas a BRONZE medal in the "Nonfiction Self-Help" category. Booklist Magazine (key supplier of reviews to the library market) has chosen Wild Ideas for its September 2017 list of "Recommendations". The ebook edition of Wild Ideas has been selected as Book of the Week by No Shelf Required, a portal that celebrates art and literature in digital form. Next Generation Indie Book (NGIBA) Awards has awarded Wild Ideas Finalist Medals in the "Self Help Nonfiction" Category AND in the "Best Overall Design Nonfiction" category. The National Indie Excellence Awards has honored Wild Ideas: Creativity from the Inside Out as a book that "truly embodies the excellence that this award was created to celebrate…"
"Wild Ideas is a unique creativity workshop in a book that should be required reading for anyone who struggles with fear, insecurity, emotional trauma, or simply unrecognized creativity. It unlocks the process to show you how to reach your deepest creativity." Read the full review. Reader Views—"reviews by readers for readers"—calls Wild Ideas "a [self-help] rarity—a well-written, comprehensive, stimulating and useful guide." Read the review. "Beautifully written and delivered, Wild Ideas is flawless in its presentation, lyrical style, and potentially life-changing message.… Highly recommended for fans of Anne Lamott." Read the full review. "Wild Ideas: Creativity from the Inside Out is about tackling anything in life with confidence: an art project, a business, relationship or lifestyle. The book is about living more authentically and not fighting the sacrifices required to do so ...a wonderful read." "An engaging roadmap for artistic expression…" Read the full review. "What I really loved about this book is that Cathy Wild did not limit her words and her advice to one kind of artist and art." Read the review. Wild Ideas: Creativity from the Inside Out was reviewed in the Sonoma County Gazette, a monthly publication with the second highest circulation in the county. Read the review. Read Cathy's article "Creativity and Your Second Act" for BoomerBloomer.com, "the Huffington Post for Boomers." An excerpt from Wild Ideas is featured in Kindred Spirit Magazine. Kindred Spirit "has been the UK’s go-to guide to spiritual and compassionate living for over 25 years." 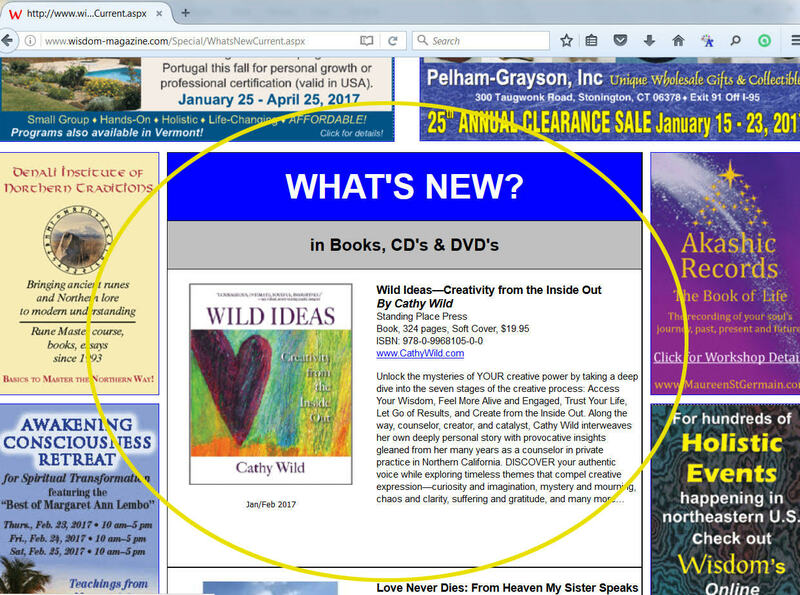 Wild Ideas was featured in "What's New" in Wisdom Magazine's three east coast editions (New England, NYC/Tri-State, and PA/NJ)— one of the country's largest holistic publications, as well as online. “…Wild Ideas delves beneath the surface … You’ll be inspired to stay the course through the chaos of creation as you tap into Cathy Wild’s deep wisdom, fully expressing what has meaning and value to you." "Wild Ideas is an honest, thoughtful, and exuberant examination of the many challenges that creatives face—and how those challenges can be met successfully. Highly recommended!" 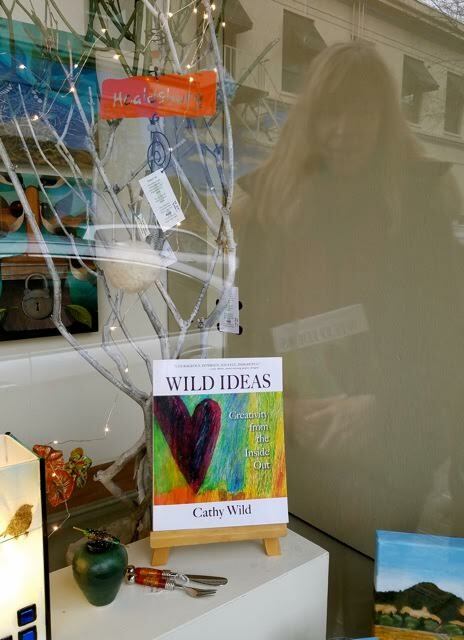 "Cathy Wild is a creative spirit who has written a brave exploration of her personal journey interwoven with wise, encouraging guidance and beautifully chosen quotes. If you long to be a creator, Wild Ideas will support you in discovering and following the voice of your soul." NEW! Interview: "Healing Anxiety & Depression with the Creative Process"
Listen to Cathy's speak about the creative path on the Inner Truth Podcast. The weekly series presents leading edge thinkers and healers answering questions that explore what it means to be human and how we can become more fully alive. Cathy was interviewed by Justine Willis Toms on New Dimensions Radio. "For over 4 decades, New Dimensions Radio has been gleaning experience and inspiration from some of the world’s most innovative, enlightened, and trustworthy wisdom leaders…" Purchase ($1.99) the the entire 60-minute podcast here. Cathy was interviewed about creativity and healing by Dr. Paula Joyce host of Uplift Your Life: Nourishment of the Spirit on the VoiceAmerica Empowerment Channel. Read article, "Creativity From The Inside Out" in Dr. Conlon's Self Improvement Blog here. Inspiring Interview on Maryanne Live! Cathy Wild shares her wisdom about creativity in a lively discussion with Krysta Gibson of New Spirit Journal (an online resource for inspiration and practical spirituality) for her TV show "Keeping It Real." Watch the interview. BONUS: Read Cathy's article "Creativity and Your Second Act" here. Cathy Wild taped an interview with Sara Troy for Choose Positive Living, a flagship show with a "unique format that is dedicated to bringing together some of the most creative intuitive positive thinking experts from around the globe…"
BONUS: Read a FREE EXCERPT from Wild Ideas on the core topic of "Risk." Sara Troy hosted a Positive Vibrations Roundtable, featuring Maureen Edwardson & Cathy Wild in conversation about "Stepping Into Your Creative Spirit." Play the interview. From the Archives: Appearance on PBS-TV, In the Prime. Cathy Wild was featured on PBS-TV's In the Prime as a creativity expert. View a 3 minute compilation clip from the original 30 minute segment here.